Many of us cross the Ohio River daily, giving hardly a thought if any, to the crossing or to the bridge we used. However, to cross the river two-hundred years ago was something one had to plan and ferryboats were the means one used. Crossing the river on a ferry was costly, and it took much time allowing for the wait in line and the time taken in the crossing itself. Not only that, but the crossing could be very dangerous. Could you imagine making the crossing in high water or in winter conditions with ice flows bumping the boat? The fare to cross the river by ferry was six pence for a man and the same for a horse. The State of Virginia set the fares. In the late 1780s poled ferryboats were serving Wheeling, Virginia crossing the river to Martins Ferry, Ohio. Ebenezer and Jonathan Zane started Wheeling’s first ferry service between 1785 and 1789. 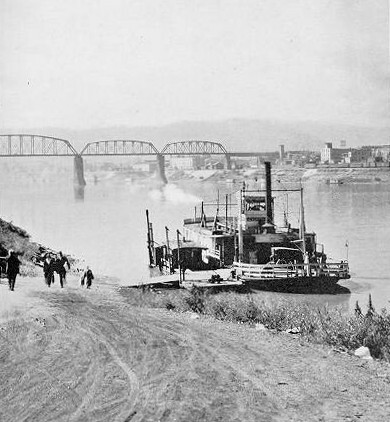 Zane’s ferry operated from First Street, in the northern part of Wheeling, Virginia, at a point very even with the north tip of Wheeling Island to land they owned on the south side of the old County Road, later Jefferson Street in Martins Ferry, Ohio, there a ferry house and tavern stood. Hearty men push-poled these early ferryboats across the river, it being very shallow north of Wheeling’s Island. See final photo. In the summer of 1789, with emigration into Ohio gaining momentum, Colonel Ebenezer Zane began operating a two-horse-propelled ferryboat from Beymer’s landing at the west end of Ninth Street, Wheeling across the Ohio Rivers east channel to the Wheeling Island to accommodate these wagon loads of emigrants. 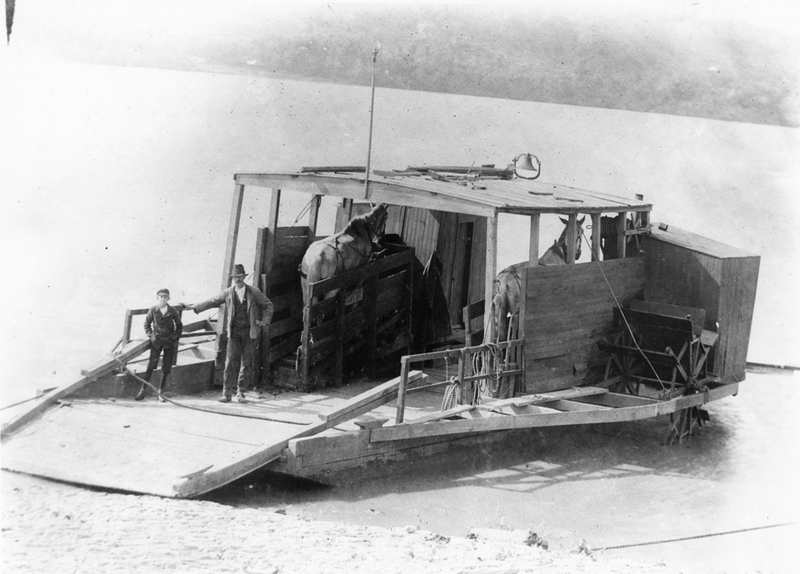 I use this photo (with permission) of a two-horse-propelled ferry titled: a “two horsepower hay burner with Capt. Horace McElfresh and son in Chillicothe, Ohio in 1900” only to show the type of ferry Zane was using at Wheeling. No photos exist of Zane’s horse-propelled ferryboat. 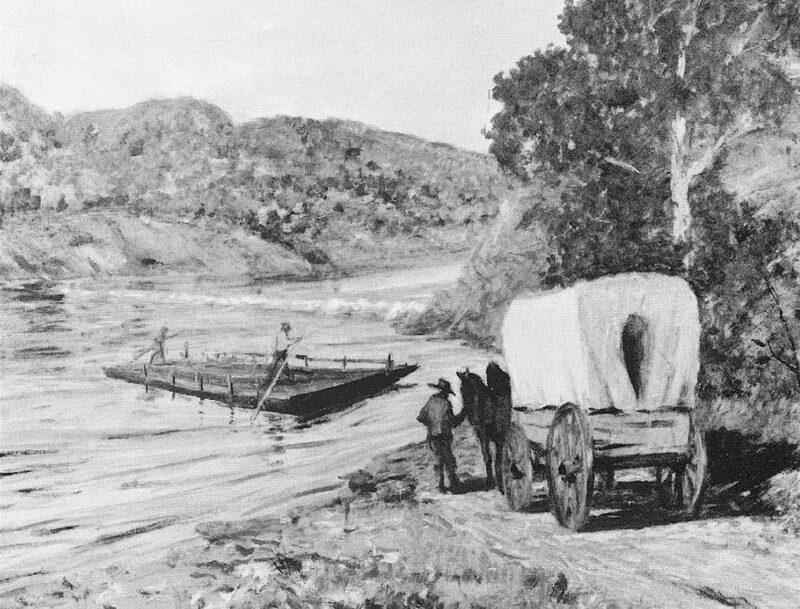 After crossing Zanes’ Island, wagons were faced with another river crossing. 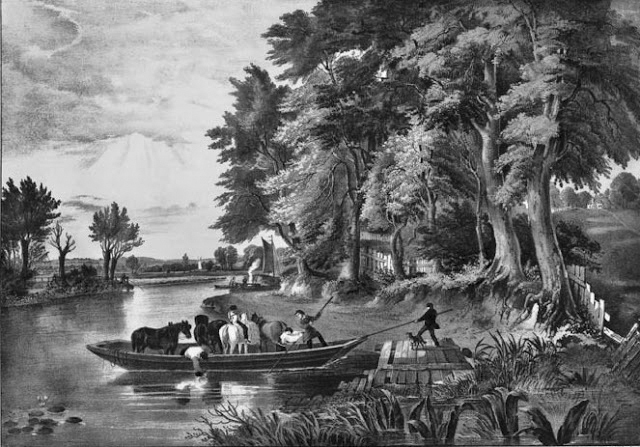 Fording the river’s western back channel was easily accomplished during low-water summer months, but spring and late fall freshets (rains) brought high water, and Zane would then employ Elijah Woods, his son-in law and one of the Fink boys to pole the wagons on a ferry flat to the Ohio shore. In 1796, Zane inaugurated his west, back channel “Current” ferry (also known to some as a “Lea-board” ferry). Walker Hunter officiated as Zanes Lea-board ferryman. Zane had placed this back channel ferry in service in anticipation of the opening of “Zane’s Trace”. The United States Congress granted Colonel Ebenezer Zane a contract on May 17, 1796 to establish a path between Wheeling, Virginia and Limestone, (Maysville) Kentucky and the requirements imposed in the contract would have Zane complete the path by January 1, 1897. 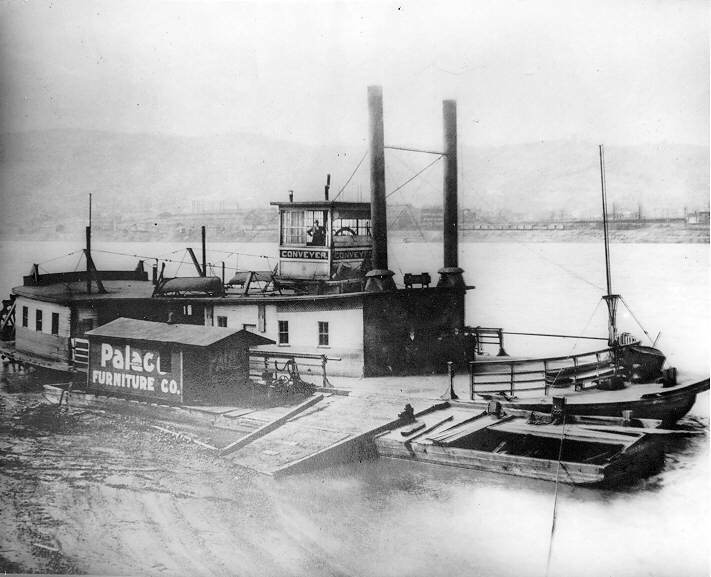 Colonel Zane was also required to operate ferries across the Muskingum, Hocking and Scioto Rivers. Colonel Zane had his “Zane’s Trace” open in 1797. Zane’s back channel Lea-board ferry operated from the Island to Bridgeport then known as Canton, Ohio until Zane’s covered bridge was completed in 1837. The Zanes had a second (east channel) Wheeling-Wheeling Island ferry, a four-horse ‘team-boat’ ferry in operation by 1807. A four-horse ferry at Wheeling was noted by a traveler in 1832. Horse propelled ferryboats had replaced poled ferryboats by the early 1800s and these in-turn were eventually replaced by steam-powered ferryboats. Both of Zane’s horse ferrys operating daily from 1807 were suspended in 1846. 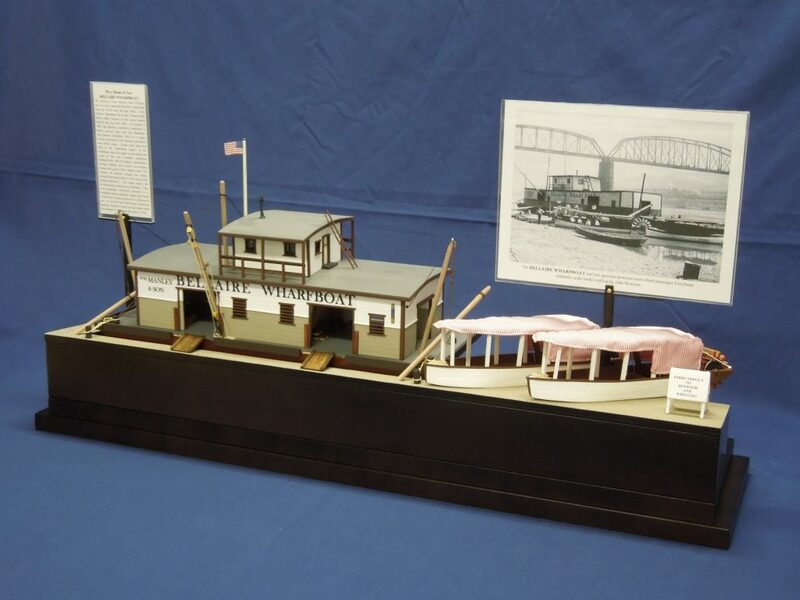 In 1846, the McNaughton & Dunlevy Boat Yard at West Wheeling, Ohio built the steam-powered ferryboat Island Packet for the Zanes using Wheeling built “A.M. Phillips” steam engines. The Island Packet replacing their horse-propelled ferrys would serve the Island until Charles Ellet, Jr. completed the Wheeling Suspension Bridge in 1849. The Suspension Bridge blew down in 1854 and steamboat ferrys were hastily placed back in service. The ferry Minnehaha served Wheeling for a short time and for the most part, ferrys filled the void until 1856, when Charles Ellet’s Suspension Bridge was back in service. From the Ohio side, in December of 1789, Absalom Martin applied for and received a license to operate a ferry between the Ohio Territory and the state of Virginia. From a beach landing above his cabin on the north side of Hanover Street, (Center Street) Martins Ferry, Ohio, Martin would pole his ferry north along the Ohio shore to a bar just south of Glenns Run, Ohio and from there, pole the boat across the river to the Virginia shore. In 1841 Absalom Martin’s son, Ebenezer began running a steam-powered ferryboat in this service. Ebenezer ran his ferry service into late 1844 and sold it to his nephew, Hugh Nichols. 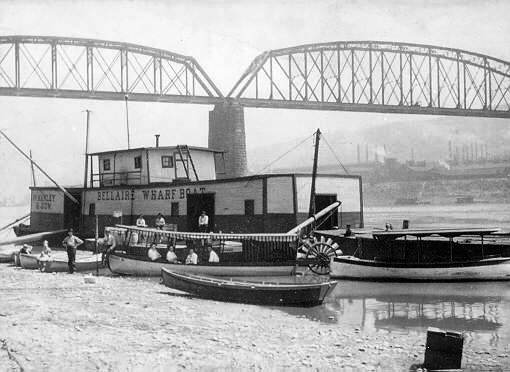 Hugh had the side-wheel steam-powered ferry Jane Nichols built at Wheeling, Virginia in 1851 that served Martins Ferry and Wheeling from 1851 to 1859. Nichols sold the boat and service in 1859 to Price-Updergraph and B.J. Long. In 1862, this service was sold to Capt. Levi W. Inglebright of Martins Ferry, Ohio. From the early 1830s, James Benson’s horse-propelled Ferry was running from Whiskey Run, West Wheeling, Ohio where Interstate 470 now crosses the Ohio River to the Belmont Mill Landing, Twenty-Fourth Street in Centre Wheeling. Listed in this service is a Capt. Cunningham who ran the horse-propelled ferryboat into 1844. The steam-powered ferry Amulet, ran this service from 1844-1846. 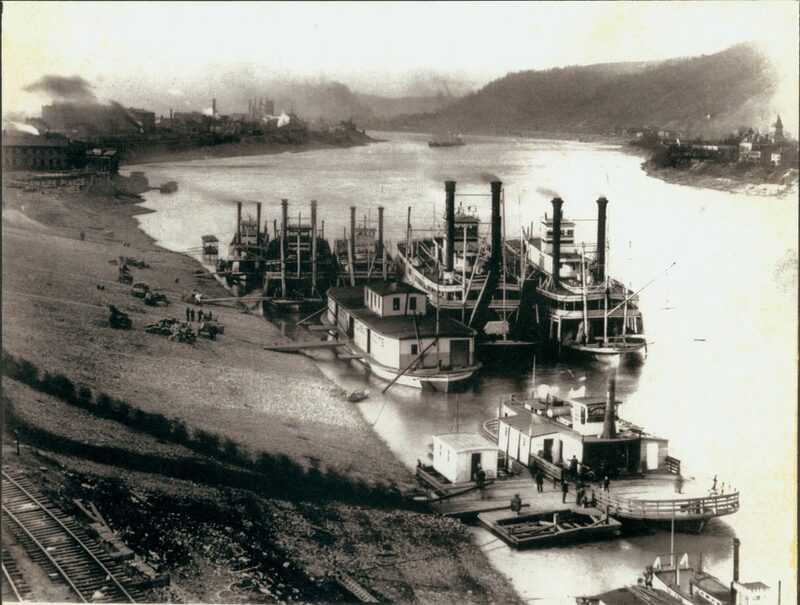 From the late 1800s, two steam-powered ferryboats were running daily from Bellaire, Ohio to the Forty Third Street, Bloch Bros. Tobacco landing and dock, at Wheeling and to Seventh or Ferry Street in Benwood, West Virginia. The last ferryboats that served Wheeling, running out of Bellaire were Gertrude and Hazel. They were passenger ferryboats powered by a Fairbanks-Morse gasoline engine that could safely ferry a dozen people over to Benwood and / or to the Forty-Third Street, Wheeling landing. Bellaire’s ferry service ended when the Bellaire Toll Bridge was built and opened in 1926. Wm. 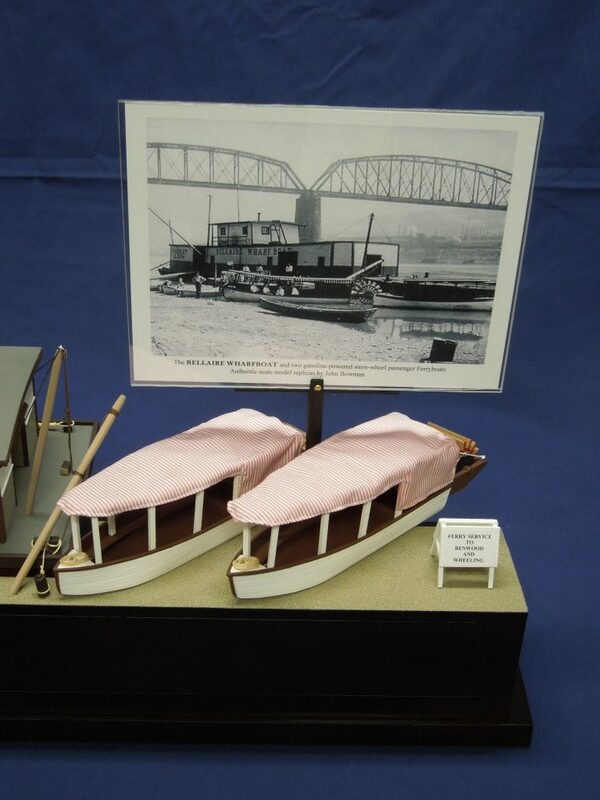 Manley & Son Bellaire, Ohio Wharfboat with Hazel and Gertrude ferryboats Model by John Bowman. Source: Early Settlement of Martins Ferry, From the Evening Times, “The Ferry Landing”, Winter 2009, Martins Ferry Area Historical Society. Source: Caldwell, John Alexander, History of Belmont and Jefferson Counties, Ohio, and Incidentally Historical Collections Pertaining to Border Warfare and the Early Settlement of the Adjacent Portion of the Ohio Valley, 1880, Published by the Historical Publishing Co. Wheeling, W. Va.